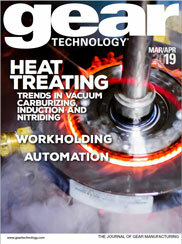 Many potential problems are not apparent when using new induction heat treating systems. The operator has been trained properly, and setup parameters are already developed. Everything is fresh in one's mind. But as the equipment ages, personnel changes or new parts are required to be processed on the old equipment ages, personnel changes or new parts are required to b processed on the old equipment, important information can get lost in the shuffle. The Instrumented Factory for Gears (INFAC) conducted a metallurgical experiment that examined the effects of carburizing process variables and types of cryogenic treatments in modifying the microstructure of the material. The initial experiment was designed so that, following the carburizing cycles, the same test coupons could be used in future experiment. I would like to comment on David Arnesen's article, "Dry Hobbing Saves Automaker Money, Improves Gear Quality," in the Nov/Dec, 1996 issue. Complete Technical Calendar for March/April 1997. Industry News for March/April 1997.